“Restaurant security cameras are absolutely the best investment ever!!! It paid for itself on the very first day! !” A Mexican restaurant owner in Astorga said on his Facebook. Restaurant security cameras and systems have long proven to be a wise investment by millions of bar, subway restaurant, and chophouse owners. And rest assured the restaurant CCTV cameras, whether hidden or visible, are generally legal as long as you don’t place them in restrooms or locker rooms where people may have a reasonable expectation of privacy. But do mind that the audio recording could be a problem in some region, though. Now follow up to see what you can do with restaurant security cameras and the best-valued ones. The security camera or system is a wise investment only if you choose the right one. Below list some restaurant CCTV cameras that will make your business much easier. A restaurant security camera system can set up a solid defense against potential dangers (both employee theft and break-ins) with comprehensive monitoring. The kitchen: The kitchen is the busiest place in the eatery. With a restaurant security camera, you can monitor the whole cooking process and therefore guarantee the food quality. You may also display what is going on in your kitchen to prove that the food you provide is absolutely clean & healthy. The dining area: As what I have mentioned above, the eating area is very prone to disputes and other issues especially for the small restaurants and fast food restaurants. A security camera for restaurant could save you a lot of troubles. The cashier’s: Most bills on the restaurant are still paid in cash. A missing note or two is hard to find out when you do the account checking. A restaurant security camera pointing at the cashier desk can prevent employee theft and fraud. The entries: If your restaurant locates in a busy street where pubs and nightclubs are around, it’s necessary to have a front door security camera to protect your property from drunkards and thieves. The parking lot: The parking lot is a place where all kinds of incidents are prone to happen. If you provide parking space for customers, it’s your responsibility to make it safe. For the upper level restaurants that most customers will drive to, a security camera is indispensable. 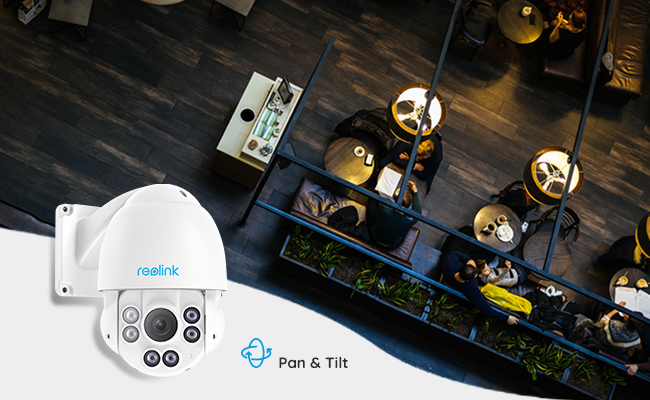 Just install the pre-configured Reolink restaurant surveillance system in 2 simple steps – plug and pay, literally, you can watch current live streaming and recorded video via desktop, PC, and smartphone. Note: This security system for restaurant allows you to able or disable audio recording according to your local laws for restaurant video surveillance. 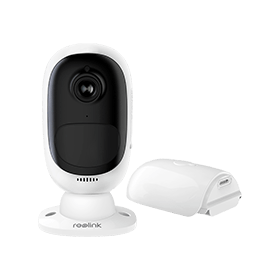 Security Bros, a professional tech review platform in the security industry, give high praises on Reolink RLK8-410B4 in terms of its competitive price (USD 479.99), great compatibility, huge data storage, super resolution, and easy connectivity. The eating area is the largest section of a restaurant where arguments and other conflicts are likely to occur, and this is especially true for subway cafes and bars where there is a high customer flow. And a common bullet restaurant security camera usually fails to cover all the spots. Here is a solution: Get a PTZ security camera for restaurant with more flexibility. The PT (pan & tilt) function allows you to adjust its viewing angle freely. Also, you may set its cruise path and let the restaurant security camera rotate automatically to get a complete picture of the eating place. Superior to PT cameras, PTZ restaurant surveillance cameras add extra zooming functionality. You will find it useful when you need to identify a specific employee who loafs on his/her job. Note that optical zoom (no damage in image quality) is preferable compared with digital zoom (degraded resolution). This PTZ security camera for restaurant provides 360° endless view, like the video below shows, which could secure the entry, the dining area, and the cashier at the same time. Continue to read the full review of Reolink RLC-423. 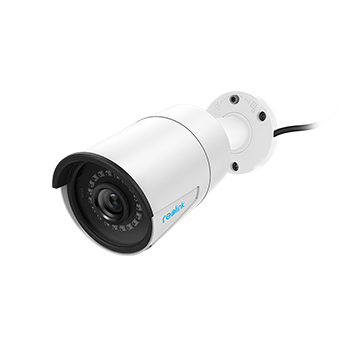 With PTZ function, 1440p high definition, excellent night vision, free & easy remote access, and quick installation, RLC-423 keeps your restaurant safe in a simple and economical way. Having a hidden camera for restaurant is generally legal even without employees or customers knowing, as long as it is not in places where people have a reasonable expectation of privacy, as I have put it. To spy and get actual evidence of people taking things from the stock room, you need a mini restaurant camera that is easy to hide under the ceiling or somewhere dimly lit, and also captures rich and identifiable details, just as clear as the video below. Reolink Argus® 2 is a very good “sneaker” with a mini body to blend in with your restaurant or bar decorations. If you hide the camera into the ceilings, human eyes can’t see it unless you look really hard, and know what you’re looking for. With no wires at all and camouflage skins, you can easily hide the Reolink Argus® 2 in the table plant indoors or on the main entries, and it’s rechargeable via solar panel so that you won’t be troubled by the quick battery drain due to the frequent restaurant customers even in the peak dining time. Do not take it for granted that you can rest on your office chair and see the live stream videos on the screen with whatever kind of restaurant security cameras in place. Check the restaurants’ conditions during the off-hours. 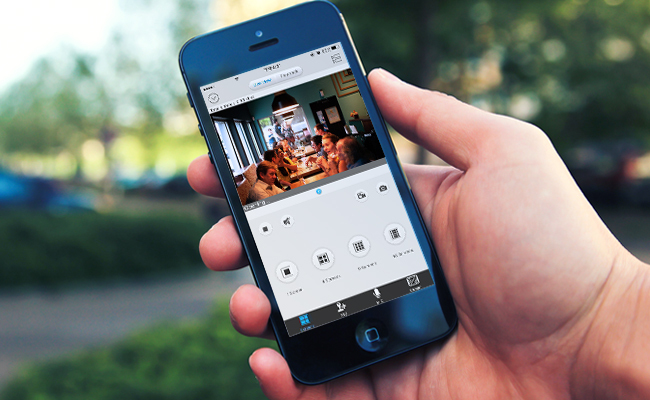 In a nutshell, the security cameras for restaurant with remote viewing capability allow you to get connected via the mobile device, computer or web browser. A point you may miss out: If you can see which customer is in need behind a screen, you can reduce the service response time and there will be less unattended customers. This is very helpful during busy hours and can greatly improve the customers’ satisfaction. Unlike the indoor surveillance cameras, a quality business surveillance camera for restaurant gains its advantages in the stable signal. Therefore, non-rechargeable battery-powered security cameras should be ruled out since they are commonly used as motion detection cameras. That’s to say, the camera will only wake up when motion (like human movement) is detected. The battery could drain very quickly due to the high customer flow of the restaurant industry. 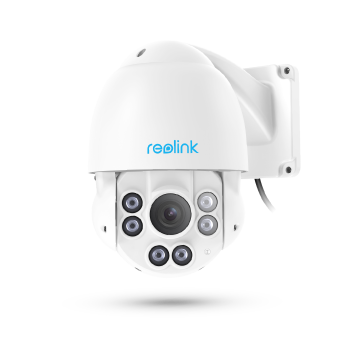 But the rechargeable battery powered security camera is an exception, which provides non-stop power supply, like Reolink Argus® 2. As for signal stability, you’d better avoid the wireless security cameras for restaurant which are easily affected by network conditions. When the network is poor, you could only hope that no accidents will happen. 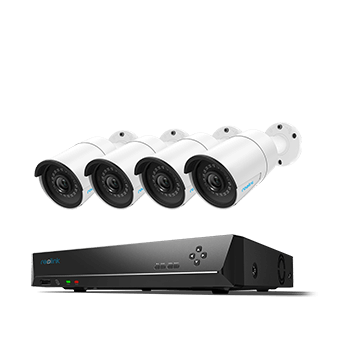 So another good choice, except for Reolink Argus® 2, is the PoE restaurant security camera which uses cable (only one) for power supply and data transmission instead of WiFi and that guarantees a stable signal on whatever network situations. Whether you are running a buffet, bar or subway restaurant, a security camera will be very helpful. Get a restaurant security camera now and you can benefit from it forever. If budget is your concern, you may follow us on Facebook or sign up to our newsletter, and you will be informed of Reolink latest sales and get the best deals. This entry was posted in Buyer's Guide and tagged Business Security. The guidance which you have shared on restaurant security is excellent. I am thankful for doing such a great job.